Industrial Matting - Temporary Oilfield Mats & Services | Newpark Resources Inc.
Newpark is the largest, most experienced manufacturer of heavy-duty composite matting systems in the world, providing leading-edge composite matting solutions to industries including oil & gas, utilities, pipeline, general construction, military, heavy haul, entertainment & film, sports arena and facility management, as well as other premium markets that require the durability and longevity of thermoplastic material for site access or temporary surfaces. 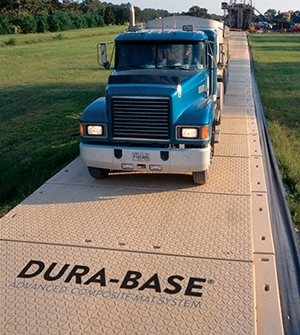 Our patented DURA-BASE® mats with their unique interlocking connection system are recognized worldwide as the preferred heavy duty working platform for temporary work sites and access roads. Our state of the art manufacturing process produces a one piece sealed mat that is simply the best product on the market. At Newpark, we provide custom-engineered products and solutions that reduce cost, protect the environment, and provide high value for our customers. We are the only mat provider with a fully developed recycling program. Our mats never go to the landfill. IF YOU USE DURA-BASE®, THEY WILL NEVER KNOW YOU WERE THERE. Our custom-engineered single-piece, sealed construction advanced composite mats reduce costs, stabilize loads, and protect sensitive environments from spills.